The L&L Kiln instruction manual alone is an education. 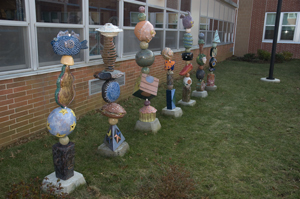 Conestoga High School in Berwyn Pennsylvania has a vibrant ceramic program, which is part of a rich and varied arts offering. 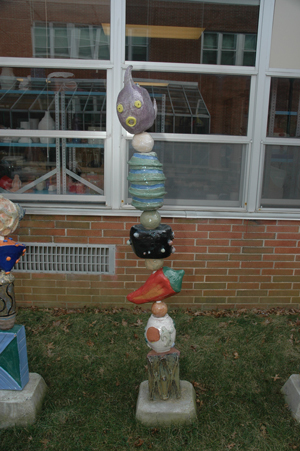 The school of about 1600 students has seven arts teachers, each specializing in different areas. John Matthews specializes in ceramics and has taught ceramics here for over 13 years. (He received his BA in Studio Art from Penn State and then an advanced degree at Tyler School of Art). 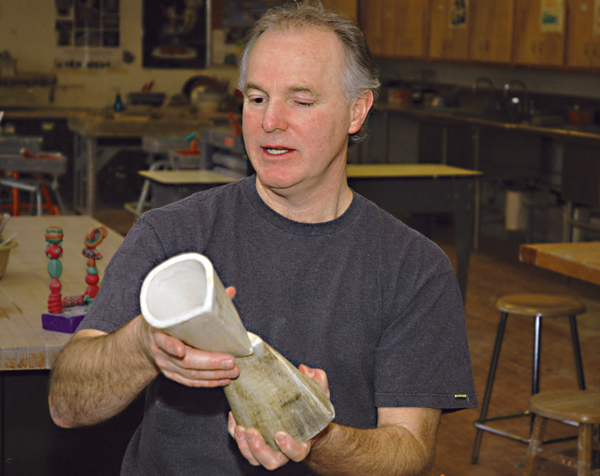 John, teaches eight classes a day, five days a week of about 20 students each, assisted in the ceramic curriculum by other art teachers (Pier Raffaele, Michael Starner and Amy Miller). The program uses five tons of clay a year (supplied by two L&L distributors: Sheffield Pottery Supply and Mark Lueders). 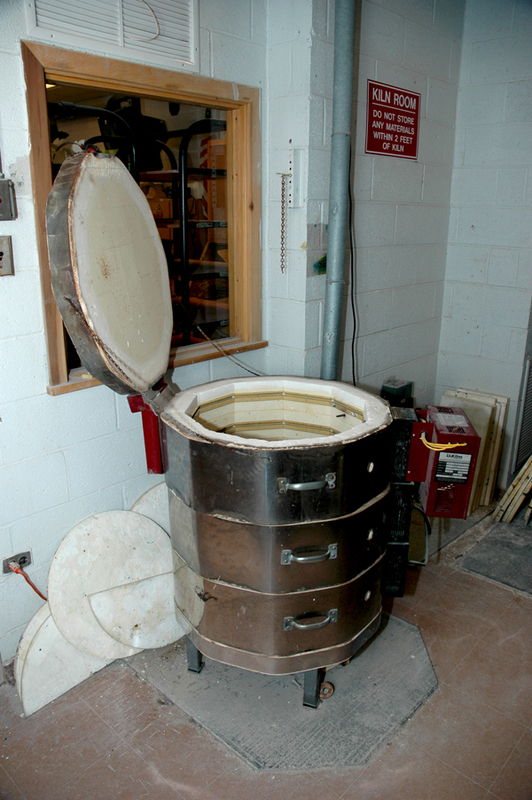 The curriculum includes wheel throwing, large sculptural clay work, and a variety of hand built techniques using a Bailey slab roller and extruder, numerous Brent electric wheels and two manual kickwheels. Bisquing is done at cone 04 and glazes, many of which John makes himself, are fired at cone 6. The two L&L kilns, one a JD230 (7 cubic feet) that is 8 years old, the other a DaVinci X3227 (15 cubic feet) that is 5 years old, get heavy use. Each one is fired once a week and, towards the end of the grading period, two to three times a week. Conestoga has always used L&L kilns – going back at least 30 years – if not longer. Why? They hold up to the heavy use of this ambitious program. 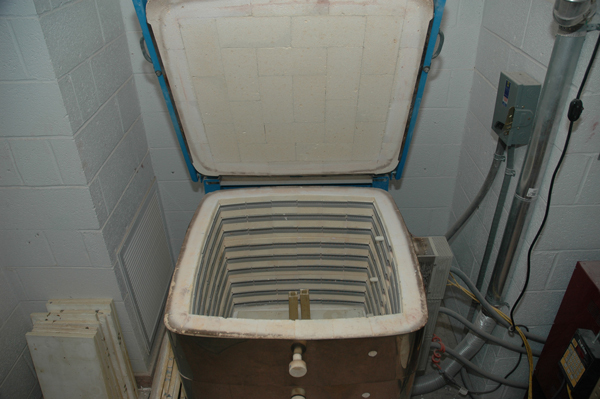 The kilns are kept in a separate well-ventilated kiln room. There is a fan pulling air out to the outside. 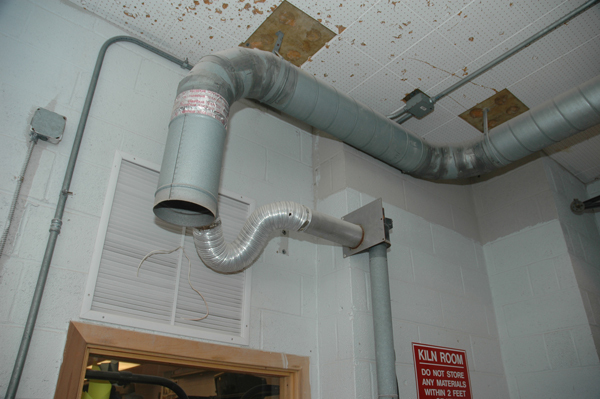 The outputs of two Vent-Sure vents vent into the exhaust ducts of this ventilation system. John makes use of the DynaTrol’s delay feature extensively, starting most firings at around 3:00am in the morning. 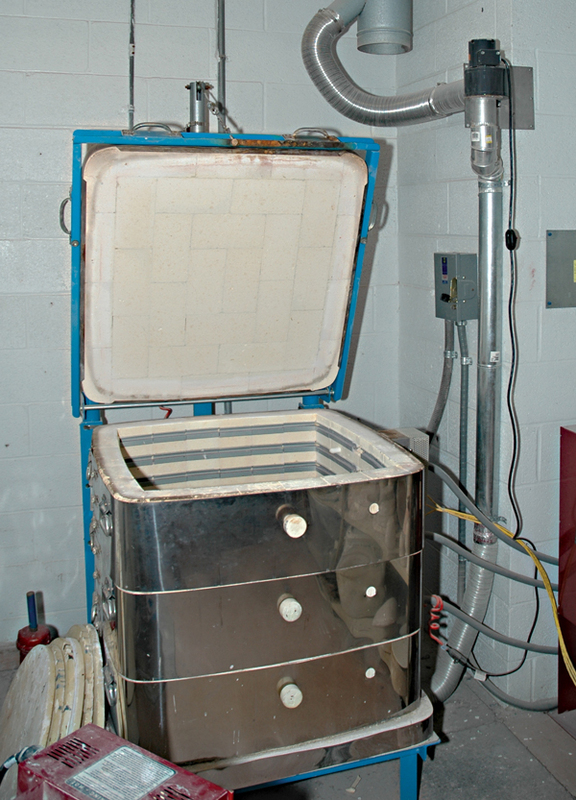 The kilns typically are in the 1000°F range when he comes in and reach maturity before he leaves the building. 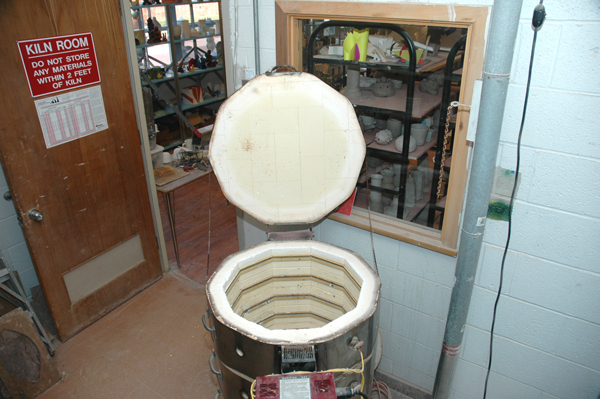 John uses the automatic Preheat program to totally dry large terra cotta sculptural pieces, sometimes for up to 48 hours, before beginning the rest of the firing program. John has pulled together a standardized list of safety tips for the schools in his district. He says that just reading the L&L instruction manual that comes with L&L kilns is an education in itself and recommends it as a rich source of information. 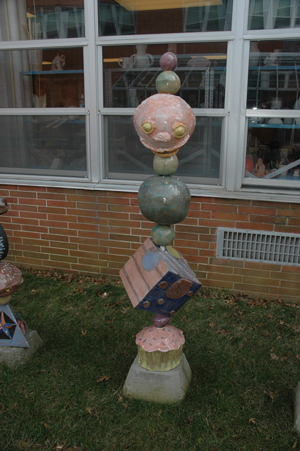 John and the Conestoga High School have unique relationship with the Chester Springs Art Center. 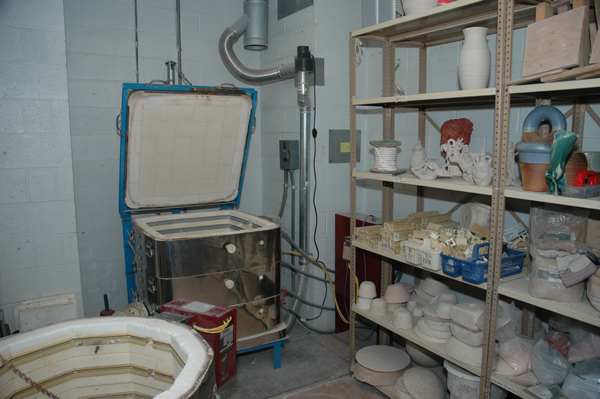 Students are able to fire their work in Chester Spring’s wood kiln. The former teacher at Conestoga, Paul Bernhardt, who figured in the early careers of some of Conestoga’s rather famous alumni, still teaches at Chester Springs. 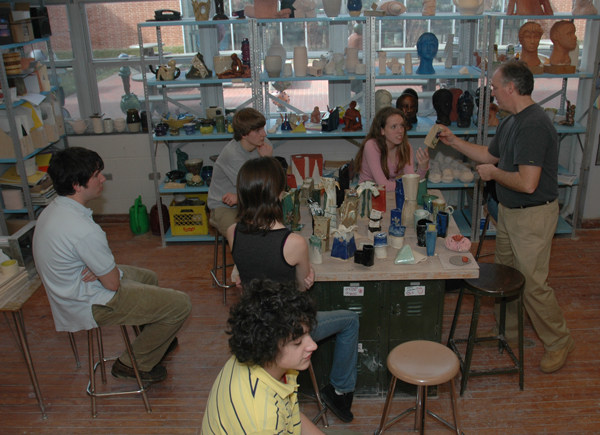 Visiting artists from Chester Springs come to demonstrate techniques in the High School. In a moment of inspiration last year, John Matthews came up with a truly creative way for his students to express themselves both as individual artists and as a collective group. In something he calls Stacked Bead Sculpture each student made up a “bead” which was the size of a small basketball (although of varying shapes). These “beads” where then stacked one on top of another like a totem pole. A PVC pipe with rebar inside to stiffen it (all invisible to the eye) keep the pieces together. John and his students decided to keep the scale human. They used the shortest and tallest student in the class as the range of heights. 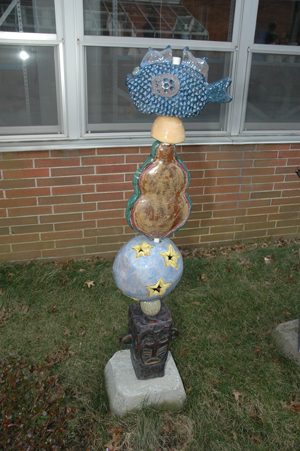 The whimsical and entertaining creation won first prize in the Chester County Art Association Outdoor Sculpture competition in 2004. 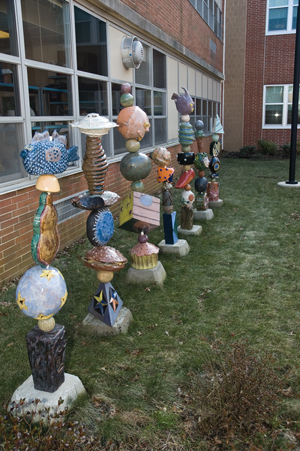 The bead sculptures now grace the courtyard outside the ceramic room at Conestoga High School. 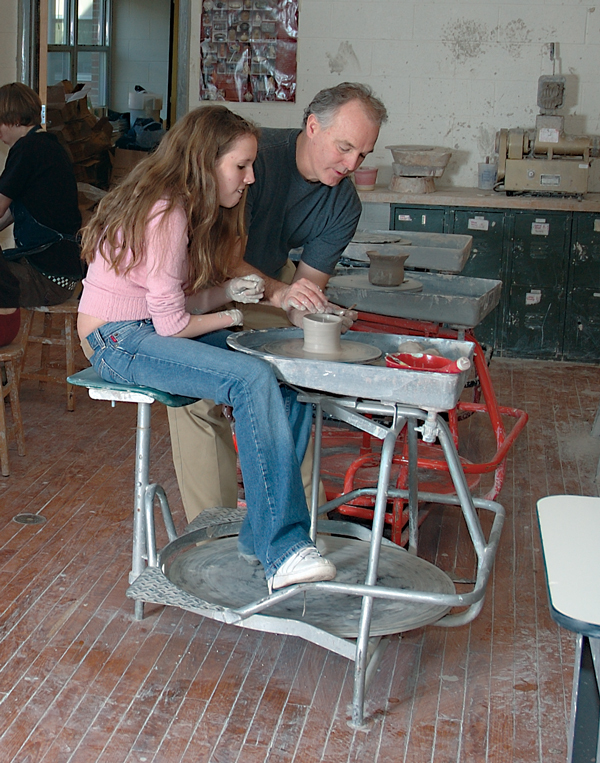 This is one of the most successful ceramic arts clay programs in the United States on a high school level. Many former students have gone onto artistic careers. A partial list of alumni includes Liz Bryant (‘93), Nick Bonner (‘73), Michael Connelly (‘90), Ginger Cox (‘71), Paul Donnelly (‘92), David East (‘85), Eric Eley (‘95), Rich Holck (‘95), Robert Howard (‘76), Mark Lueders (‘87), Malcom Mobutu-Smith (‘88), Chris Staley (‘73) and Jeffery Warnock (‘94).